Working with the most amazing contortionists in the UK many who have been featured in films or worked Internationally Calmer Karma are able to bring stunning contortion acts to your event whether you are looking for a breathtaking staged act or a wow factor ambient act for guests arrival we have the perfect contortionist to wow your guests with their mind boggling moves! 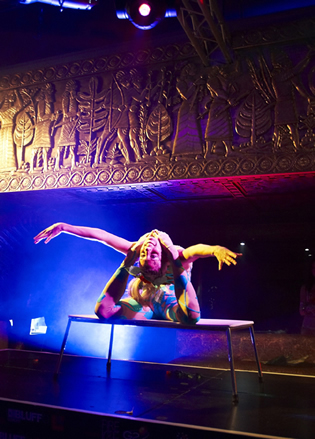 For additional wow factor we also have contortion acts in a box, contortion acts coming out of a cake and choreographed doubles contortion acts available. ALICE IN WONDERLAND - CHESHIRE CAT OR ALICE IN A CAKE OR BOX!